Gamers Unite! The Video Game Revolution by Shane Frederick. A Pop Culture Revolutions Book. Review: Have you ever wondered how video games were started? The trend started really slow from an idea so crazy that it seemed like it could never be done. Ralph Baer, the creator of video games, thought people would want to do more with their TVs. People said that his idea was absurd. However, we have achieved it. Before, people would just sit and watch TV, without any interaction. Today that is exactly what people do. They are following this idea that Ralph Baer came up with. Nowadays many people play war games on TV with their friends. This idea was absurd back when Ralph Baer was alive. How did this really start? What was the first gaming system? What games we're playable back then? What did the games look like? How did these games evolve over the years? You will find out everything and more if you read Gamers Unite! The Video Game Revolution, written by Shane Fredrick. A group of 21 students responded to a survey regarding video games and their content. Those statistics showed that 17 out of 21 students think that video games should be rated by age. Plus, in regard to violence in video games, 6 people said that it should be included, 6 people said that it should not be a part of video game content, and 9 people said they would like to see occasional violence included in their video games. This book would be a great investment for schools, because kids would be able to read about why certain games are appropriate and why some are not. Children will be able to understand some of the benefits of playing certain games also. I recommend Gamers Unite! The Video Game Revolution for anyone who is a gamer. It can teach kids about video game safety. I like how the author, Shane Fredrick, included a timeline in the back of the book in order to show the evolution of video games. Even though I consider myself a gamer and a huge Xbox fan, the information made me rethink my beliefs about video games from the time of their creation. 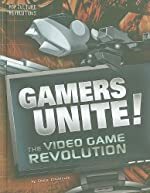 The author used various descriptions and photos that helped me understand the changes of video games over the years. I recommend this book for gamers of all ages. We would like to thank Media Masters Publicity for providing a copy of Gamers Unite! The Video Game Revolution for this review. Have you read Gamers Unite! The Video Game Revolution? How would you rate it?